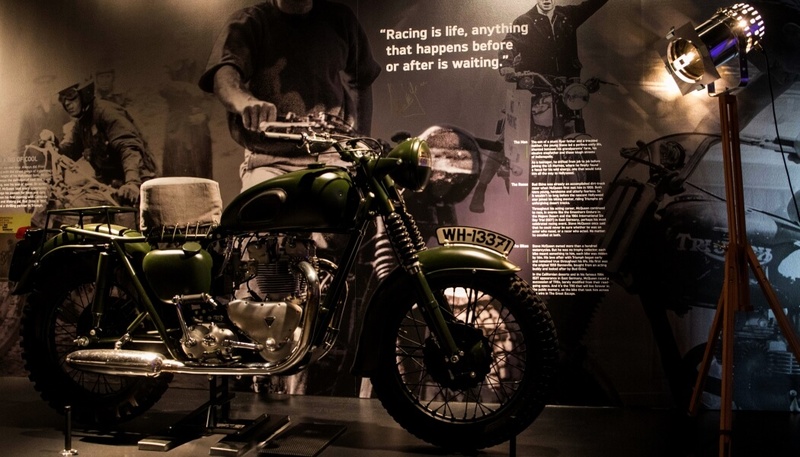 The new Triumph Factory Experience delivers an engaging journey that tells the full story of the brand and showcases Triumph’s historic and modern achievements in design, engineering, racing and popular culture. To ensure every element of the tour is showcased to its fullest, over 200 Concord Beacon spotlights have been installed throughout the space. The project has been nominated for a 2018 Scottish Design Award. 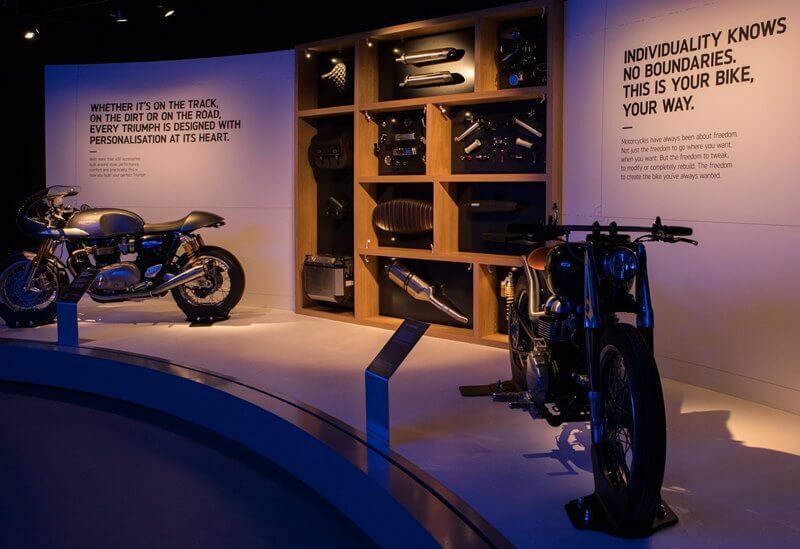 Spread across eight distinctly-themed areas, the exhibition showcases rare original models from the brands 115-year history including legendary Triumph movie bikes; from Steve McQueen’s original Great Escape movie bike, not seen since filming completed in 1962, to Tom Cruise’s Mission Impossible 2 Speed Triple. These valuable memorabilia require careful consideration when it comes to putting them on display, especially in terms of the lighting. They need to be protected from harmful radiation and ensure they look the best they can for visitors to the tour. LightMedium selected 200 Beacon Accent spotlights as well as 50 Beacon Muse spotlights with accessories, which have been installed across the visitor centre and in the cafe. The exclusive guided factory tour provides unprecedented access to Triumph’s unique engineering and manufacturing process and facilities. 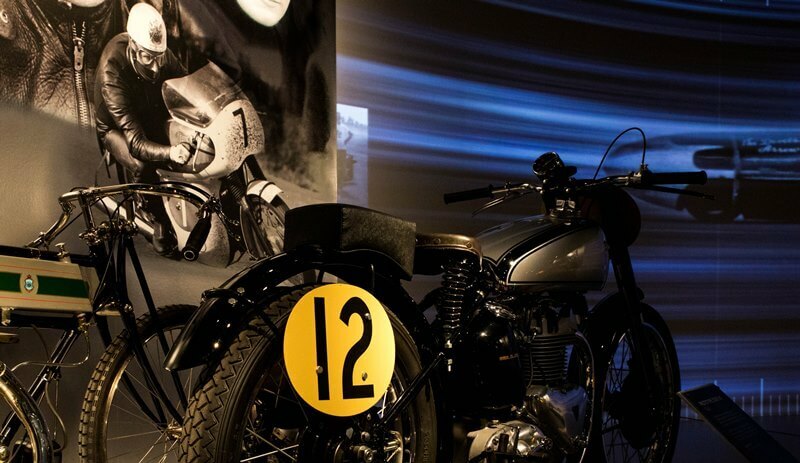 Iconic motorcycle memorabilia, dealer signage and racing ephemera. The Concord Beacon Accent spotlights have a compact and minimalist design with low glare and dark-light detail for increased accentuation and visual comfort, making them perfect to highlight the variety of exhibits in the visitor centre. Concord Beacon Muse spotlights take focussing to the next level to ensure the most intricate of details are accentuated. The spotlights use warm, high colour rendering LEDs, with the beam angle adjusted accordingly to effectively light each exhibit. The spotlights feature an adjustable optic system which can deliver a wide flood 65˚ beam angle which can be adjusted down to a 10˚ spot without the need for additional lenses or reflectors. The 10˚ tight spot is ideal for accent lighting for accentuating the texture, colour and shape of exhibits. Its 65˚ wide flood distribution can be optimised for uniform vertical and horizontal illuminance and wall washing effects. Also, when used with an elongation lens accessory, it can create narrow beam angles for highlighting the unique bikes. For more information visit www.sylvania-lighting.co.uk.